After retiring from his first career as the Chief of Social Work and Chaplain Service at a VA Hospital, Bob Kelter didn’t move down South to enjoy the warm weather. Instead, he decided to go back to school to get the necessary training to become a Paramedic. Bob remains active in a number of areas in the community where he lives, including volunteering at his local EMS agency and Fire Department. 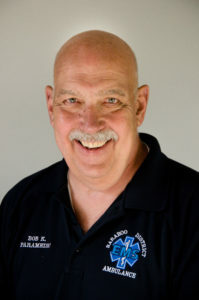 He also works part-time as a Paramedic at Baraboo District EMS, and as a clinician for the Good Neighbor Clinic in Prairie du Sac and with the Columbia/Sauk Counties Critical Incident Stress Management team. Bob arrives at each shift with a smile on his face, ready to positively impact the patients that he treats. He is well-liked and respected by his co-workers, and he has excellent patient care skills. Bob has also taken a special interest in the Community EMS / Paramedic program that was recently approved by the State of Wisconsin. He has arranged and attended a number of meetings to garner support of the program within the community, and has been proactive in advocating for the implementation of this new program. For these reasons, Baraboo District Ambulance is proud to call Bob Kelter a Star of Life.